Yes, the world faces substantial environmental challenges — climate change, pollution, and extinction. But the surprisingly good news is that we have solutions to these problems. In the past fifty years, a remarkable number of environmental problems have been solved, while substantial progress is ongoing on others. 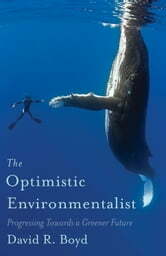 The Optimistic Environmentalist chronicles these remarkable success stories. Endangered species — from bald eagles to gray whales — pulled back from the precipice of extinction. Thousands of new parks, protecting billions of hectares of land and water. The salvation of the ozone layer, vital to life on Earth. The exponential growth of renewable energy powered by wind, water, and sun. The race to be the greenest city in the world. Remarkable strides in cleaning up the air we breathe and the water we drink. The banning of dozens of the world’s most toxic chemicals. A circular economy where waste is a thing of the past. Past successes pave the way for even greater achievements in the future. Providing a powerful antidote to environmental despair, this book inspires optimism, leading readers to take action and exemplifying how change can happen. A bright green future is not only possible, it’s within our grasp. It was a true delight to read such a well written Survey of what is the current state of our progress cleaning up planet earth. Thx. To put it simply, this book is a breath of fresh air during times when we, as a society, tend to look at the monumental task of improving how we interact and impact our environment with gloom and despair. David Boyd concisely encapsulates how around the world steps are being taken to reduce and even reverse climate change. Though there is a great deal of work still to be done, he gives so many concrete examples of how we are actively succeeding to reverse the negative impacts human activity has imposed on the world. A must-read for anyone who has felt dread that we may have irreversibly damaged human capacity to live on this world, and who is looking for good news that will drive you to do your part to make things better. Absolutely loved it.